Growing up in a family with mental illness, Sarah was no stranger to suffering. 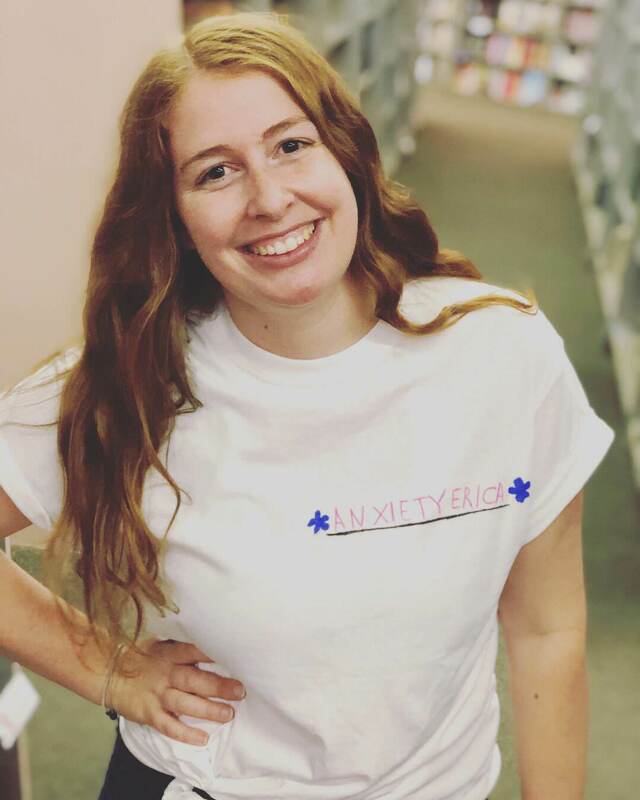 Living with anxiety, panic attacks and insomnia since she was just four years old, she didn’t reach out and get help until the intense hypomania of her undiagnosed bipolar disorder took a dark turn. Trading in her straight-A student role for an out of control musician, this creative soul eventually realized that medication would save her life. Not just surviving, Sarah is thriving through bipolar disorder. Writing music around mental health, performing at high schools to educate teens, and even practicing aerial yoga, these fantastic forms of self care have kept her going, while helping others heal as well. I’ve had anxiety, panic attacks and insomnia for as long as I can remember. I come from a family with mental illness on both sides, and I grew up watching grown ups struggle, panic, and lose control, so I thought my experiences were just par for the course. When I was four, I slept with a fisher price knife under my pillow because I was scared someone would crawl through my window. When I was eight, my parents gave up trying to find a way to help me sleep after exhausting all their resources. When I was fourteen, I had one of my panic attacks, the one where suddenly everything is in slow motion and I forget basic motor skills, during a french class and failed a test for the first time. No one seemed to think any of this was out of the ordinary, and I never went to the school counsellor because none of the teachers even knew my name. I was too quiet. But the quiet was about to end. In my late teens and early twenties, I went from a shy straight A student with an artistic side to a university-drop out musician who drank wine on the bus and had screaming matches in the streets. I felt completely out of control. One day I would feel excited, and feel sure that I was in the right place at the right time and it was only a matter of time before I would be opening for Feist on the big stage at a festival, and then I would wake up a few days later feeling heavy, feeling empty, and for the first time, suicidal. I would go to band practice and lie on the floor in tears. Everyone realized something was happening before I did. My behaviour pushed away my best friend, every boyfriend I had, my bandmates, and my roommates. People begged me to get help. People told me that I was broken and I needed to be fixed or no one would ever want anything to do with me. This was bipolar disorder, a new beast that was harder to ignore than anxiety and panic attacks. The thing about bipolar disorder is that it can seem like so many different illnesses depending on when you go to the doctor. The first time I decided to get help was when my best friend told me she wouldn’t be my friend unless I went on medication. I went to my family doctor who promptly diagnosed me with depression and put me on a waitlist to see a psychiatrist. But of course, soon I felt better, I felt like I didn’t need a doctor and I couldn’t imagine why I thought I ever did, and I would cancel the appointment. The second time I went to the doctor, I was diagnosed with bipolar disorder type 2. I rejected this diagnosis because I knew I was “crazy,” and I really didn’t want my ex-boyfriend to be right. Bipolar was something people had been teasing me about for quite some time. The third time I was diagnosed with bipolar disorder, I found myself at the hospital on boxing day, a week after my soulmate told me he couldn’t watch me suffer anymore. The doctor spent some time tracking my moods and finally asked me if I had ever “heard of bipolar disorder before,” worried she would scare me away with that big word. By that time, I had done enough research and read enough books to know that I had bipolar disorder. I accepted the diagnosis without a second thought. The doctor said that treating the bipolar might take away my ability to write songs, and that a lot of people miss the creativity of hypomania when they go on medication. I didn’t care about being a musician anymore. I didn’t care about anything but getting better. It’s true that medication changes the creative process for people with bipolar disorder. Before my recovery, I would black out and wake up with a song. It was the only easy thing in my life. But bipolar doesn’t provide me with my creativity. Hypomania provides artists with a chance to write without our inner critic. I’m now learning to write songs thoughtfully, with extreme focus. It’s harder, but not impossible. My medication has completely stabilized me, but it does have it’s unfortunate side effects. I sleep a lot. I am constantly dehydrated. I can’t drink alcohol anymore. And of course, the unexplained ecstasy of hypomania is gone from my life forever. But I can have a steady job, a real relationship and a working memory, so I think it’s worth it. My life is still all about coping with bipolar, anxiety and panic attacks though. I exercise every single day, I take mindfulness classes, I go to DBT groups, I see my therapist and my psychiatrist often. I put my mental health before any job or other responsibility. I think back to a time not so long ago when I was overdosing, praying I would never wake up, and I remember that vigilant self care is the only thing that has kept me from returning to those life or death situations. I also write music about my mental illness and share them with others. I’m lucky to have an outlet, and I’ve found a community of artists also dealing with mental illness who help inspire me to keep going. Living with anxiety has forced me to learn how to rationally face my fears. When your fears are every where, you can’t help but bump into them at every turn. Now I feel as though I can do almost anything, whether that be travel to a different country or play on a stage to thousands of people. Learning to treat my anxiety has introduced me to all sorts of fantastic coping mechanisms… from mindfulness to aerial yoga to pole dancing! Living with bipolar disorder, on the other hand, has given me an ability to help other people. I have learned to live with a severe mental illness and now I get to help others, whether that’s through releasing my new album “When I Get Better,” or performing at high schools with the BC Schizophrenia Society’s musical/educational show “Reach Out Psychosis.” It’s also a great way to weed out fickle friends. If you have friends who will stick with you through bipolar treatment, you have very good friends. You are worth loving, even with your mental illnesses. Anyone who tells you otherwise is wrong and should be forgotten immediately. Misdiagnosed with depression, Beata heard the words “bipolar disorder” for the first time in 2008. Finally given a name to her struggle in her thirties, she’s thrived on a detailed plan for mental strength and wellness. Building a blog, Tickle My Mind, that shares her own journey – as well as the stories of others – Beata preaches a message of self care, support, and sustaining your goals. I was diagnosed with bipolar disorder in 2008 and recently diagnosed with Generalized Anxiety Disorder (GAD). My first symptoms reared up in my teens. I spent a lot of time in my teens and early 20’s living the party life and living life on an emotional roller coaster. In 2008, I heard the word “bipolar disorder” for the very first time. I never felt more alone than I did in that moment sitting in my car outside my doctor’s surgery, looking down at my prescriptions with names I couldn’t pronounce, to treat an illness I had only ever heard bad things about. When the word bipolar was first mentioned to me as an illness, I immediately froze. I did not know anyone who had bipolar and my only experiences with the term had come from overly exaggerated and stigmatizing representations. In that moment I immediately rejected my diagnosis. I didn’t feel comfortable with it. I didn’t get properly diagnosed until I was in my thirties. I think I was late in getting diagnosed for a number of different reasons. My psychiatrist and doctor always refer to me being ‘high functioning’. Throughout my journey from undiagnosed teenager to diagnosed in my thirties, my mental health affected almost every area of my life. Education, career, my self-image. I was first misdiagnosed with depression only. I was prescribed anti-depressants to treat it and ended up suffering a severe manic episode. In most cases, prescribing anti-depressants only to a person who has bipolar disorder can trigger a manic episode. That was the moment the doctor realized it was more than only depression. Honestly, I did not know what it meant – but I learned pretty quickly. It meant I was very sick, that I was self-medicating an illness I had no idea I had, and that unless I sought and accepted treatment, my life would not be as happy and productive as I had planned or dreamed it would be. Yes I still experience episodes, but these full-blown episodes are now very rare. I have created a mental wellness plan that helps keeps me stable and well. I’m constantly learning more about myself and my illness, and any new research – my plan is a living document that can be improved and refined when needed. My wellness plan did not get created overnight. It was a process of trial and error over a period of time. To be honest, it’s still a work in progress. Some of the things my plan includes is taking my medication as prescribed every day, visits to the GP, healthy eating, exercise, meditation, tracking and monitoring my triggers and mood, no alcohol or illegal drugs, a strict sleep routine, practicing self-care, gratitude and journaling. Positive psychology has also played a big part in my wellness strategy. Scientific research has shown that there are strategies and skills that allow you to navigate the challenges of life more effectively and enjoy life despite the upsets. It may seem like a lot of hard work, and it is – but it does get easier. I have been diagnosed with a chronic illness and like any chronic illness, there are a number of lifestyle changes that need to be incorporated into your daily life. Another important thing that I need to mention – you can’t do this on your own. You need to reach out for help. Your friends, family, GP, mental health organizations – they are all there to support you. With the right combination of lifestyle changes, and medication, I have been able to manage my illness successfully. Preventing a relapse requires motivation, a commitment to your own health, discipline, structure, courage, and more importantly a belief that you can get better. Make yourself a priority. Every battle with a mental illness is different, my message is, be patient. There will be setbacks, sometimes big ones, and possible relapses, but there will also be moments that take your breath away for all the right reasons. My motto is to hold on. It took me a while to learn this and that’s okay. Everyone is on their own journey moving at their own pace. Everyone will have their own ways of coping and their own ways of dealing with their illness – but please don’t be afraid to seek help, or to talk about how you feel. I created Tickle My Mind, which is a place for me to write about my journey with mental illness and a place to empower as many people who have been touched by mental illness to live a healthy, happy, rewarding and balanced life. I am currently writing my first book, part memoir, part mental wellness guide and I’m studying a Diploma of Positive Psychology. I am also a Community Ambassador for RUOK? Day. I now find happiness in writing, a pastime I never thought I would be doing. I love spending time writing and promoting mental health awareness. Tickle My Mind is a place I share stories, lessons and tools that helped me to succeed, become well and to continue to stay well. Now, I advocate mental health wellness and I hope the things that I have to share will help someone else – somewhere along their journey. One thing I know for sure – it truly is possible to live a happy, meaningful and productive life despite what it throws in our path. Without my mental illness, I doubt I would have become the strong, determined person I am today. I have learned to be non-judgmental and I have developed a strong burning desire to help others. I met my husband and soulmate, who is the single most joyful and important thing in my life. Would I feel so deeply? Would I make the most of every happy day and squeeze as much into them as possible, the way I do now? Would I have created Tickle My Mind and studied Positive Psychology, which means the world to me without the experiences I have had to inspire me? Would I have learned who my true friends and family are, those who have stood by me no matter what and who make my life so blessed and fulfilled? Would I be the person I am today, who I am so proud to be, without all of those experiences and without my bipolar disorder? I don’t believe any of those things would have happened without my illness. I don’t believe that I would be the person I am today, without what I have been through. I want to be honest, and say that managing bipolar disorder isn’t easy. At times you may feel defeated, find yourself discouraged, and want to stop treatment. Every time I feel that way, I need to remind my that my brain isn’t functioning properly. I don’t resent having bipolar disorder, it’s part of the person I have become. I made sure that I continued to reach out to my friends and loved ones for support. Looking after myself or self-care, is important in helping me stay at the top of my physical, emotional and mental well-being. When things are getting a bit tough, it becomes so important for me to take good care of myself. Whether it’s a stressful period at work or home, taking time to focus on self-care is essential to my well-being. Self-care helps me function at a higher level, and feeling good enables me to take on life’s challenges. Silently suffering with OCD, depression, and anxiety since she was nine years old, Veronica didn’t think getting help happened until you were really at rock bottom. Exposure and Response Prevention therapy on a weekly basis combined with her website, Story of the Mind, where she shares her own story, as well as others, has taught her a newfound perspective that she’s not a bad person, she just has OCD. I have Obsessive Compulsive Disorder, anxiety and depression. To be honest, my OCD started when I was about nine, however it quieted down until I was about 15. My anxiety levels also really started to rise during this time. At first, I didn’t realize what I was experiencing was OCD, as it doesn’t comprise of the stereotypical handwashing or repetitive behaviors. It seems to be heavily obsession based with mental rituals. It all centers around me being bad and doing bad things. I didn’t realize that what I had was OCD until I was 19 – I just thought that I was a bad, horrible person. In addition to the OCD, I struggle with panic attacks, being anxious in social situations and also general anxiety about pretty much whatever my brain can freak out about. With the OCD, I believed that I was truly the worst person in existence. I believed I deserved to be dead for the horrible intrusive thoughts and obsessions that I was having. The more I reacted, the more I became distressed over what was happening in my head the worse it got. My OCD compulsions are a series of mental rituals and phrases – on the outside no one would even know (despite my often distressed appearance) that I have OCD. I used this as justification that proved I was a monster, I didn’t have OCD – I really was the most terrible person in existence. I really wish I knew that my parents thought I had OCD when I was younger, I think that really would have helped. The thing is my OCD obsessions are the worst things I can imagine a person doing. They are so ego-dystonic ie. not in line with my beliefs and morals that they have had such an impact on my self worth and value as a human being. Anyone who knows me would say that I try to always be kind to everyone – no matter who they are – and would never want to even be mean, let alone commit an awful crime, or do something bad. This is what gave them so much power over me. In 2015, I moved overseas by myself and my OCD sky rocketed. Every waking moment was filled with obsessions. I would be lucky to have 20 minutes cumulatively in a day when they weren’t screaming in my head for a whole year. I still hadn’t figured out that it was OCD at this stage. I was depressed and suicidal. I was having more panic attacks than one can count, but that worked in a funny way. I would keep incredibly busy and purposely do things that made me anxious, like flying and traveling alone. I would be so anxious about the situation I was in, I wasn’t quite so focused on the obsessions. But even still, I look back on my photos from that year and could tell you exactly what my brain was saying at that point in time, it was graphic and terrifying. Then began the obsessive exercise and eating minute amounts of food. I wreaked havoc on my body to try and quiet my mind. I lost my period for over a year, my heart became slow, I lost my hair and I was dizzy and sick. I set all these rules for myself and was constantly thinking about how many calories I had eaten or burnt or when I could allow myself to eat next. I swapped one obsession with another (I know it’s slightly different – I mean that it occupied so much brain space fixated on food I was focusing so much on the intrusive thoughts). When I started to eat again and cut back on the exercise, then another harmful tool of self punishment took its place. I would hurt myself in almost a compulsive way, trying to prove to myself that I didn’t like these thoughts, that if I hurt myself then I wasn’t a monster. Right now, my OCD is not as bad as it has ever been but it’s still quite severe, there’s now just other things going on as well. Some days my brain won’t shut up but occasionally I can get a bit of quiet from them. It still has quite a hold on me, but at least now I’m starting to get proper help. It’s been a slow road and probably something that will never fully go away, but a bit less would be quite nice. This year I’ve been hospitalized, tried my third lot of medication and had to reduce much of my course load at university (something that my high achieving type A personality is still trying to accept). I’m now doing Exposure and Response Prevention therapy – the leading psychological treatment for OCD weekly and trying all of the things to get better. I’m not going to lie, ERP is hard. You have to expose yourself to your biggest fears and face them without resorting to anxiety reducing compulsive behaviors or mental acts. But it will work, I’m sure of that. I am learning that I am not a bad person, I just have OCD. It took me a few years from thinking about speaking to someone to finally doing it. I am writing this because I wish that I had done it sooner and not let myself get to the point I have been recently. Maybe this was inevitable, but I really just want to let you know that even if you think it’s not that bad, or that others have it worse, or that you don’t deserve help until you reach crisis point, please understand that you do, and the sooner you are supported, the better. To be honest, things are starting to improve only the last month or so and quite slowly. Getting on the right medication has been instrumental in this as well as seeing a Psychologist and Psychiatrist weekly. One thing which has definitely had a positive effect on my ability to cope is actually just talking to people about it and not bottling it all up inside. It is so important to reach out and talk to someone when you need help – whether that is in person or through a helpline. It has actually saved my life a few times for sure. I think that it has probably made me more aware of what is happening to other people around me and helping me to empathize with others having a hard time. To be honest, it is just a little part of me, which has significantly affected me and I don’t know what I would be like without it. It has given me the opportunity to speak to others on my website who are doing amazing things and to be able to connect with others. Just go and talk to a professional. It took me years of thinking about it to actually get it done. I want people to know that it is quite ok to ask for help and it doesn’t need to be a big secret. I think it’s important that young people know that you don’t need to wait until it gets really bad and completely unbearable to get help, if there is something that is bothering you then it’s worth talking to someone about it. I know that a lot of people, I used to include myself in this, often think getting help means that you aren’t excelling at life. But honestly it means the opposite. It means that you are committed to helping yourself get better and that requires some serious dedication and bravery. You don’t have to do this all alone. Suffering silently through his depression, it was when a teacher noticed his pain that he decided it was time to ask for help. With a firm belief in making your mess your message, Connor is on a mission to show others the hidden blessings in a life with mental illness. I first realized my mental health was more than just a teenage phase after experiencing two grueling years of a severely deflated state. I initially thought it was all down to the transition period of school to college because it made me feel like a small fish in a big pond and I lost contact with many school friends. The people I did still talk to didn’t share the same thoughts and feelings as me, so I resorted to Google and discovered countless articles about depression, anxiety etc, but I was in disbelief. I didn’t want to accept that this was what was wrong with me because I’d seen depressed people in TV shows and films, but I wasn’t like them. I brushed it all off but over time my situation got worse. I began skipping lessons to avoid being around people and this quickly turned into skipping entire days of college so I could stay at home where it was safe, easy and comfortable. I could play games and escape the world and even myself. My social life was non-existent, horrendous diet, no motivation for anything and a constant feeling of self loathing and sorrow. In an instant, it dawned on me that maybe I actually was depressed. I was recommended to see a counsellor on site at college and I did because I was starting to worry about my exam results and how they would affect my future. After a couple of weeks of this counsellor I got a sudden urge to help myself further and receive help from my local doctor too. Currently, I am in a far better place than I have been for the six years of my battle. My journey has made me realize how strong I actually am and despite mental health knocking me down, I’m always able to get back up; even if it takes me weeks or months to recover from a set-back. My OCD in particular is still as persistent as before, but I’m now able to keep on top of the emotional aftermath and not let things spiral out of control as often. I now think of my problems as challenges that are there to test me and make me grow, which really makes the whole situation less daunting because the only outcomes from these challenges is that I either win or I learn. Whenever I get these negative thoughts or emotions, I try and use them to my advantage by using the energy as fuel and converting it into something positive which then often times allows me to push further, due to the added incentive/reason. The main skills I’ve been able to learn from all this is being mindful, which in my opinion really has been a game changer and has given me moments of clarity which is hard to come by with all the usual mental fog. Ultimately the best thing I do to cope is give myself plenty of TLC and treat myself as my own best friend – rather than my worst enemy. I believe in making your mess your message and I’m constantly trying to make the most out of the bad situations. I think of my mental health conditions as a blessing disguised as a curse – on the surface it creates pain and suffering, but there’s always a deeper meaning and learning opportunity to grow from. I always tell myself that I’ve been given this life because I’m strong enough to live it and with this attitude it gives me a positive approach to any obstacle that life throws at me. Although I’m not necessarily proud of my problems, I am proud of the person I have become from all this. I’ve gained a stronger level of compassion and empathy as well as a genuine desire to help support and love others who are in need. Overall, I would say mental health has given me an opportunity to express myself fully and create something beautiful out of what others would see as a tragic end. The advice I would give myself would be; ‘You’ve come too far to give up now.’ Life has thrown some tough situations your way but you’re still here, you survived it all and you’ll continue to overcome anything else in your path. Instead of questioning ‘why me?’ you should be saying ‘try me’ because you are stronger than you think and capable of whatever you put your mind to. When you finally beat your mental health, you’ll become an incredible person that could only have been sculpted by the life you’ve lived. You still have a lot to learn, but keep thinking long term because it will all be worth it. You’ve got this. With a diagnosis of BPD, depression, anxiety and complex trauma, Danika has been through her darkest time. It was with medication and cognitive behavioral therapy that she started to see the light – however, she wasn’t fully healed. A conversation with a friend mentioning BPD brought answers and led her on the right path to healing. Preaching a message that it’s okay to struggle, read how Danika’s journey taught her to search for kindness and patience within. My diagnosis’ are borderline personality disorder, depression, anxiety and complex trauma. I realized in my teenage years that the feelings and moods I was experiencing – and had been experiencing from such a young age – had to be more than just teenage hormones. I just knew that I felt differently from the people I was surrounded by and I felt incredibly lonely. It affected my relationships with just about everyone so as a result of that I became even more lonely. It was affecting my desires for life, I pretty much took no pleasure in the things that I used to enjoy and I felt incredibly numb, empty and angry. I started having seizures when I was 16 years old, so I went to the doctors and whilst investigating the seizures, my doctor began to ask me about my mental health. That’s when I opened up about how I had been feeling and at that time, I was diagnosed with anxiety and depression and my seizures were diagnosed as non epileptic attack disorder, also known as psychogenic seizures. I was prescribed medication and put on a waiting list for cognitive behavioral therapy. I had regular check ups with GP in relation to my mental health along side the CBT, my GP was lovely and I couldn’t fault her, but I still continued to feel exactly how I had in the beginning. At this point, I still didn’t know how to even begin to describe it or explain it fully. Years passed and I was talking to a friend about mental illness. She brought up Borderline Personality Disorder – something I had actually never heard of! It was like she was describing exactly how I had felt my entire life. I didn’t want to just assume that’s what I had, so I went to a doctor, which was really hard. I was finally able to describe my moods and behaviors properly and not too long after, I was diagnosed with Borderline Personality Disorder. My day to day is unpredictable along with my moods. I am in recovery, but it’s not linear and I still face bad days and the challenges that come with it. Recovery is a full time job. It’s a massive challenge to put everything I learn in therapy into practice for my every day life and sometimes it’s just too much. I don’t feel like I can do it, but one skill I have learned is to be kind and patient with myself, as I would be with another human being. I’ve found that allowing that kindness and patience is taking away a lot of the pressures I put on myself, along with the feelings of guilt and shame. Living with mental illness is not glamorous, it’s debilitating, it’s hard work, it’s full time. I will say that it’s definitely given me insight into other people, I’m very intuitive and understanding. I’ve gained knowledge and a kindness and compassion within me that I think is very rare. It’s okay to struggle. Not every day will be a good day and while I’ve encountered bad days – I am super proud of myself for holding on. Are you a work in progress? Share your story below and you may be featured on the blog!